The Bombay High Court System Officer Recruitment is announced officially to fill 159 posts of System officer and 40 posts of senior System Officer at district and taluka courts in the state of Maharashtra on the contract basis under the provision of 14th finance commission as per the notification, So the interested aspirant can apply for Bombay High Court System Officer Recruitment the last date of the application is 26-02-2019. The applications are available for the Bombay High Court System Officer Recruitment 2019 from 12-02-2019 onwards, so the candidates who have an interest they need refer essential qualification, Age limit, Fee and Registration dates etc. And have continuous information about the Bombay High Court Senior System Officer Recruitment 2019, and System Officer checks an official website following below. The Bombay High Court announced the notification for 199 system officers and senior system officer these are the contract basic period of one year, the contenders who are interested in the Bombay High Court Recruitment of Sr System Officer they can stay here and check their eligibility criteria and Educational Qualification, Age Limit and other details and apply online in the official website following below here the total number of vacancies also mentioned in detail (Total 149 vacancies for the System officer posts and 50vacancies for Senior System Officer) so the interested aspirant can apply for the Bombay High Court System Officer Recruitment 2019. Must hold a Degree of B.E./B.Tech. In Computer Science Engineering/ IT/ Electronic Engineering/MCA/ equivalent qualification from recognized University And Must possess Network Certifications. Must possess additional certifications like MCSE(Micro Soft Certified Systems Engineer)/ RHCE (Red Hat Certified Engineer) or equivalent qualification and RHEL (Red Hat Enterprise Linux). The contenders who are not 40 years age as per the publication of the notification date issued by the Bombay High Court Recruitment 2019 for System Officer. Age Relaxation of the candidates belonging to SC/ST and communities recognized as backward by the BHC Officials for the purpose of recruitment shall be 45 years as per the norms. The list of the eligible candidates and date of interview will be published in the official website of the Bombay High Court an http://bombayhighcourt.nic.in. 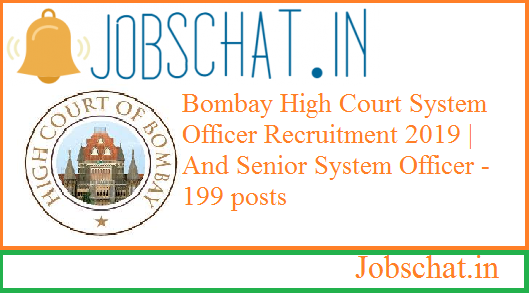 The aspirant check the eligibility details and the experience for the 199 system officer, and senior system officer post recruitment announced by the Bombay High Court recruitment 2019 and here the applications are accepted from the date declared by the authorities of Bombay High Court, check your details and apply in the official website, the list of eligible candidates and the date of the interview can be published on the official website of Bombay High Court at bombayhighcourt.nic.in within short dates for those who enrolled for the BHC System Officer Job Openings 2019. As per the bombayhighcourt.nic.in System Officer Notification 2019, The role of the system officer is daily uploading the data to the national judicial data grid resolving the day by data technology-related issues and the facility the principal district judge in monitoring and analysis of the data in the national judicial data grid and check the daily reports and the aspirant who is selected in Bombay High Court System Officer Recruitment 2019, and Senior system Officer they will follow the terms and the conditions of the district court, for more information regarding this Bombay High Court System Officer Recruitment 2019 check the official website mentioned below.